Tanzania is the largest nation in East Africa with an estimated population of 49.9 million citizens. Its official language is Swahili, though English is also widely spoken. Its first independence president was the late Mwalimu Julius Nyerere. Tanzania is home to Africa’s highest mountain, Mount Kilimanjaro. The official currency used in Tanzania is the Tanzanian shilling. The flag of Tanzania was adopted in December 1964; this was after Tanzania had attained its self-rule and independence from the British colonialists. Tanzania Flag is an origin of the flags of the former Tanganyika and Zanzibar. The two countries merged in April 1946 to form current Tanzania. The colours of the national flags of Zanzibar and Tanganyika were merged to form the current Tanzanian flag. They adopted colours from both national flags of Zanzibar and Tanganyika as a sign of respect and equality. Tanzania flag is hoisted on all government and public buildings and institutions across Tanzania. 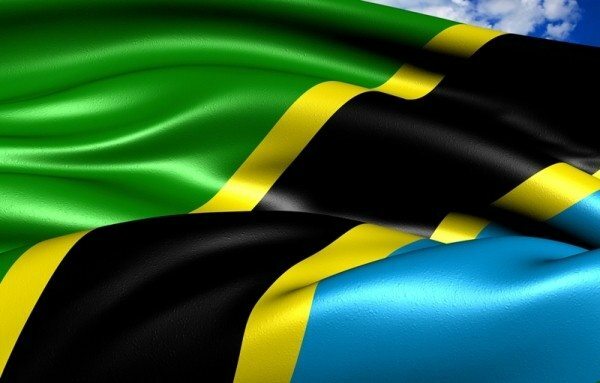 The national flag of Tanzania comprises of four colours which are green, yellow, black and blue. The green colour is at the top while the blue colour comes at the bottom, the black colour falls in between the two strips of the yellow colour. The colours on the flag of Tanzania take a diagonal shape. The green colour on the Tanzanian flag symbolises the natural resource that Tanzania has. It shows how Tanzania is rich in natural resources and green vegetation. The green colour on the Tanzanian flag also symbolises peace; it shows that Tanzania is a peaceful country. It symbolises agriculture and the fertility of the Tanzanian land. The green colour also represents the forest cover of Tanzania. The green colour on the Tanzania national flag reminds Tanzanians on the importance and need to practice agriculture and protect the forest cover, for the prosperity of the land. Green also reminds people to maintain peace in the country. The yellow colour on the Tanzanian flag represents the natural mineral deposits found on the land of Tanzania. It symbolises the huge and rich minerals deposits that Tanzania has. The yellow colour reminds the people of Tanzania to make good economic use of the rich minerals found in Tanzania for the well-being of the nation. The black colour on the Tanzanian flag represents the black skin of the people of Tanzania. It stands for the patriotic Tanzanian nationals. Black reminds the people that they are all one and no one should divide them or intimidate them because of their skin colour. The blue colour on the flag of Tanzania represents the many water bodies found in Tanzania, it represents the lakes, rivers and the Indian Ocean. Blue encourages the people of Tanzania to make proper use of the water bodies across the land. The Tanzanian national flag is a symbol of national unity and sovereignty. The Tanzanian flag also is a symbol of unity and togetherness among the people of Tanzania. The Tanzania flag is the sole property of the republic or state under the custody of Tanzania government. The country has been termed as one the archeological sites in history. Some remains of man were found in the country; Olduvai Gorge is situated in Tanzania and it is here that the world’s earliest human skull was found. The nation is also rich in culture with over one hundred and twenty languages being spoken in the country, most of which are of Bantu origin. The country is termed as an agricultural nation with most of its income being generated from agricultural practices. Most citizens are farmers and the staple food among the people of Tanzania is ugali, which is made of a mixture of corn or sorghum flour and cooked like porridge though made thicker. The music of the people of this great nation includes traditional African music and commonly sang in the country is string-based music called taarab.